In the middle of a marine park and surrounded by a group of uninhabited smaller islands, Alonissos is one of the least visited Sporades Islands. You’re right to wonder why too, it’s got beautiful beaches with the cleanest, clearest waters and some of the best hiking routes in the group. 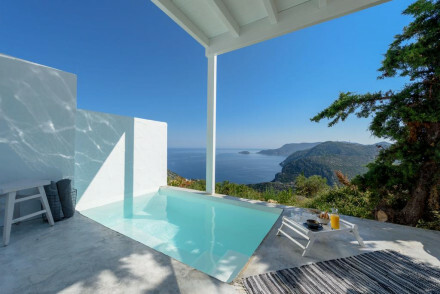 Our Gurus agree that the best places to stay on Alonissos are all also blessed with beautiful views. The best hotels on Alonissos are a fairly exclusive bunch. There’s just one main road on the island, which stops off at each of the three villages, so everything is linked by this single route. The main port of Patitri is on the island’s south east corner and is where you’ll come in by ferry from Volos, Agios Konstantinos or Thessaloniki. This is also where you can catch the ferry to the other islands in the group: Skiáthos, Skopelos, and Skyros. Take a boat trip around the Marine Park and enjoy the beautiful surrounds. You might even see some dolphins if you're lucky! Spend the day soaking up the sun at the gorgeous Agios Dimitrios Beach. The Alonissos Museum is a great place for culture-vultures to learn more about the island's past. Don't forget to plan well ahead if you want to guarantee a room in one of the best places to stay in Alonissos. This is a small island and the top accommodation gets snapped up quickly, especially during the peak summer months. The 13 bright, contemporary rooms and suites of the Ikion Eco Hotel all have their own balcony with views of the mountains or the ocean. Despite being priced from around £65 per night. You’re close to 13 beaches, with the nearest just 150 metres away, and just a short walk from shops and restaurants. Hotel Yalis is a great spot for families or groups. They offer comfortable, unfussy suites just a short distance away from the beach. Armonia Rooms boasts charming minimalist accommodation with breathtaking vistas of the Aegean Sea. Some rooms even have their own private mini-pools! A lovely getaway. If you'd prefer the privacy of a self-catering option then check out the wide variety available online with our partner, Booking.com. Best time to visit Alonissos is during the summer, with the average daily temperature rising to 24°C in July and August. This, however, is peak season, so for a quieter and cheaper alternative consider coming in spring or autumn. Fly into either nearby Skiathos Airport or Athens Airport before catchng the ferry across to Alonissos. Overlooking the Aegean Sea, Hotel Yalis is a charming holiday destination. Offering simple, comfortable self-contained suites and apartments, it's well suited for families or small groups. Just a stone's throw from a great beach, this hotel's views will always have you coming back for more. Great walks - Alonnissos has a wonderful coastline that is really well suited to coastal walks. Fishing - Take a fishing trip out into the Aegean for a day. Local markets - Browse the local market of Botsis. Light and tranquil private rooms with breathtaking views of the island and the sea, beautifully furnished with nuanced minimalist design. Communal pool while some rooms have private mini-pools. A place to lose yourself. 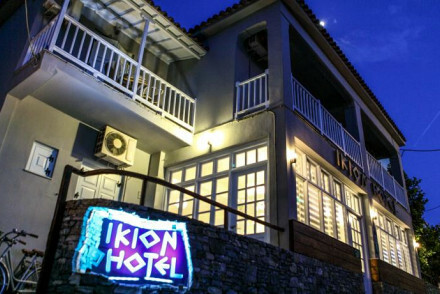 The Ikion's contemporary decor and bright rooms provide the ideal place from which to explore Alonissos. All rooms feature a balcony with sea or mountain views plus the hotel is 150m from the nearest beach. Breakfast is served in the garden and restaurants and shops are within a short walk. Beach Life - With 13 beaches nearby, and some of the clearest seawater in the world, Alonissos is the perfect beach destination. Families - A warm and welcoming well priced hotel, with family suites only 150 yards from Roussoum Gialos beach. Diving - Alonisssos is home to the largest natural marine park in the Mediterranean, and the ideal place for diving. Sights nearby - You can explore the deserted islands off the coast, or the picturesque towns within Alonissos itself.